When my climbing partner told me that I needed to go to Elizabeth Street Café in Austin, Texas, I stared at her baffled. I was traveling to Texas – the land of BBQ and Tex Mex – and her first recommendation was a Vietnamese restaurant? California hosts 40% of the US’s Vietnamese-American population. I grew up close to “Little Saigon” and my dear Vietnamese-American friends have introduced me to the freshest Vietnamese foods. I grew up in California and quickly become accustomed to the flavors and smells of lemongrass, chilies, ginger, mint, and shrimp paste. I found it hard to believe that I would find Vietnamese food even on a par with that from home. Then two additional friends highly recommended this café. Curious and confused, I conceded and made this the first restaurant stop during my stay in Austin. Immediately welcomed onto a porch with blush pink doors and cyan window frames, my partner and I decided to sit outside for the full Austin experience. Austin’s winters are known for being temperate, and because the summers are wickedly hot, many restaurants have spacious outdoor seating arrangement. Ironically, cold and heavy rain welcomed us during our visit, but we seized this moment of calm in the storm and took the opportunity to sit outside - albeit under heating lamps. Everything on the menu looked amazing. Deliberating for a solid 10 minutes on what to order, we decided to share (as we always do) a few dishes. Vietnamese dishes aim to incorporate five fundamental taste senses (spicy, sour, bitter, salty, and sweet) to correspond to five organs that are fundamental to digestion: the gall bladder, small intestine, large intestine, stomach, and urinary bladder. 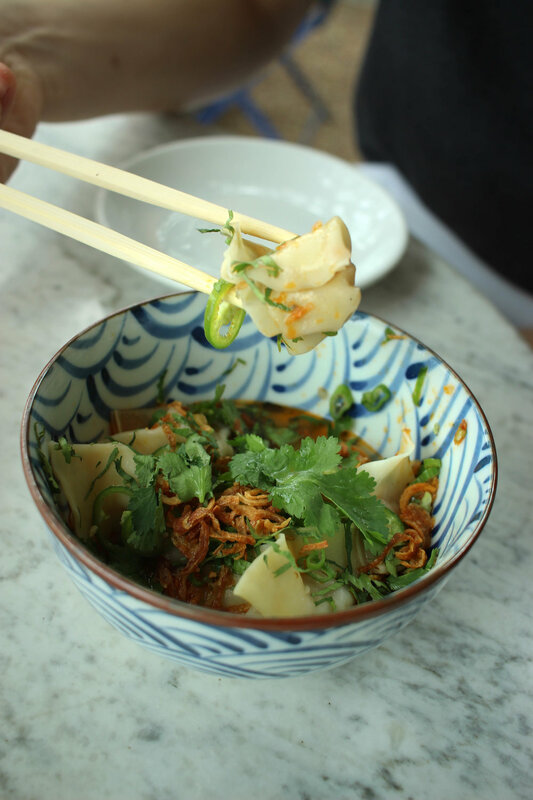 Vietnamese food is also considered by one of the healthiest cuisines in the world, as it finds the perfect harmony between spices, fresh herbs, and meats. The food is aromatic, but not overbearing. Our first dish, Rice paper and vermicelli spring rolls, perfectly exemplified this balance. We chose the ginger marinated grilled tofu with breakfast radish, thai basil, and serrano. The rolls came with an assortment of dipping sauces, and we alternated every bite dipping between them. The sweet chili vinegar added acidity, the ginger jalepeño added heat, and the peanut sauce’s heaviness complimented the lightness and freshness of the delicate rice paper. Next we shared the ginger-chili oil dumplings. Filled with pork, shrimp, water chestnuts, and herbs, these steamed beauties came doused in a glorious dipping sauce. For the main course we shared a piping hot bowl of pho ga (chicken pho) with chicken thigh and cilantro chicken meatballs. 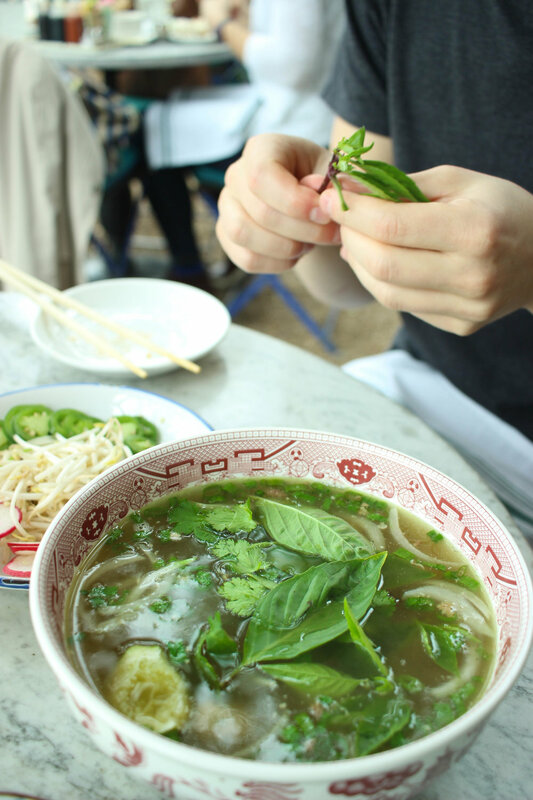 We topped the soup with fresh bean sprouts, garden herbs, jalepeño, and lime. Tobi got a good work out in with some impressive noodle lifts. This place lived up to the hype and most importantly, dispelled my preconceived notion of what types of foods I should expect to find in Austin. 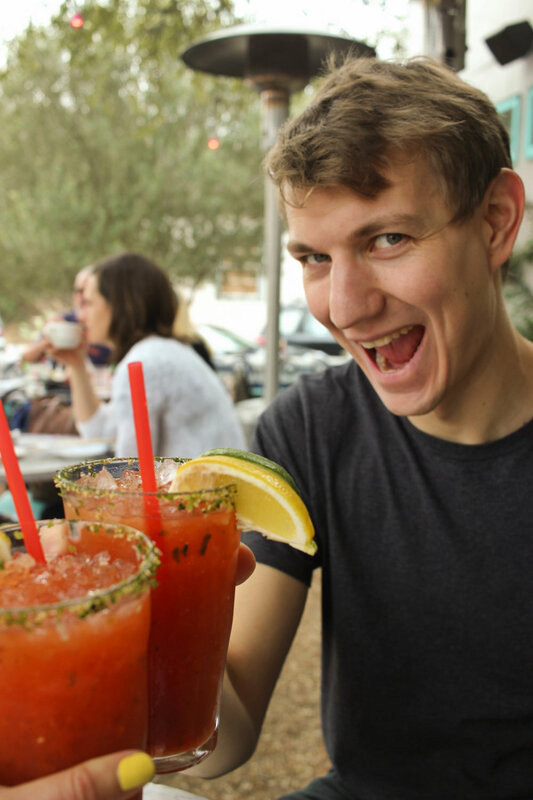 Austin's food scene has a lot to offer, and if I head back there I am looking forward to continuing my food tour. I will also definitely make a stop here again - the food is just too good to pass up.